ONLINE REGISTRATION IS NOW CLOSED. IF YOU WISH TO ATTEND, PLEASE CALL US AT 503-552-8811 BEFORE 3PM TODAY. In downtown Tigard Pacific Rim Martial Arts Academy is developing Olympic athletes for Tokyo 2020. Recently designated as one of only four official Olympic Training Centers in for elite US judo athletes, PRMAA hosts training camps attended by the world’s top competitors. 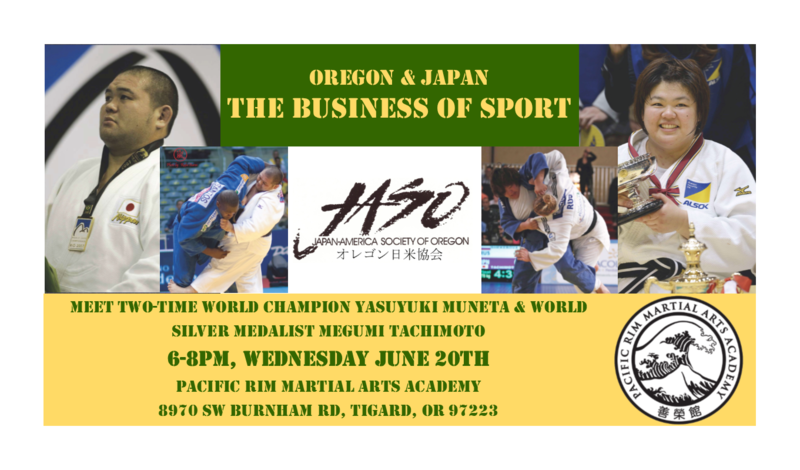 Join us and meet two-time World Champion Yasuyuki Muneta and World Silver medalist Megumi Tachimoto, in Tigard at PRMAA as a part of their preparation for Tokyo 2020. Learn how Oregon and Japan connect through judo competition, exchange programs and athlete development. Tour the facility, meet the athletes, enjoy food and drink, and spend time networking with other JASO members. This event is free of charge for members and just $10 for non-members. You must register in advance.